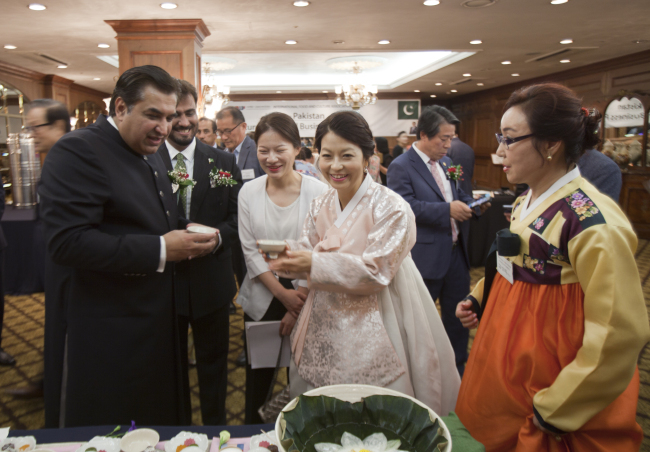 The Pakistani Embassy in Seoul, in collaboration with the International Food and Culture Exchange Association of Korea, co-hosted the inaugural Pakistan-Korea Culture, Food and Business Forum at Imperial Palace Hotel Seoul on July 10. Pakistani Ambassador to Korea Rahim Hayat Qureshi said the two countries shared many similarities, including colonialization and independence shortly after World War II. While Korea gained its independence on Aug. 15, 1945, Pakistan was established as a sovereign state on Aug. 14, 1947, through the partitioning of India after centuries of British colonial rule. “Our historical similarities also extend to our peoples and cultures. We both hold our elders and teachers in high regard, and faithfully devote ourselves to our families,” he said at the event, which was attended by more than 100 Korean businesspeople and dignitaries. Pakistani and Korean singers and artists performed as well, with participants enjoying the two nations’ cuisines. Qureshi highlighted that both nations’ languages had linguistic similarities in terms of sentence structure and common vocabulary as well. “Pakistan, with the sixth-largest population in the world and 80 million people in the middle class bracket, is an ideal destination for investment,” he stressed. Korean congressman and chairman of the Financial Committee at the National Assembly, Rep. Cho Kyung-tae, expressed appreciation in a speech for efforts to bring the Pakistani and Korean peoples closer to one another through food, culture and business. “Pakistani food is delicious and its culture is rich. We are very proud of this collaboration with the Embassy of Pakistan, and would like to organize more similar events for the benefit of both countries’ peoples,” said Ryoo Hyun-mi, chairperson of the International Food and Culture Exchange Association Korea. 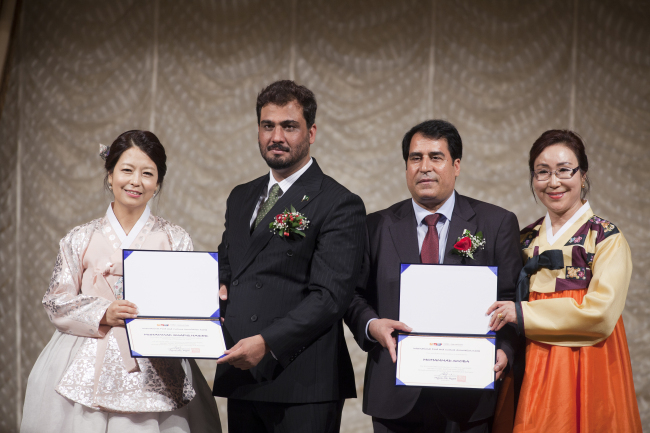 Ryoo also presented certificates of appreciation to Muhammad Shafiq Haider, a counselor for community welfare and cultural affairs at the embassy, as well as Sooba Khan, a Pakistani-Korean businessman and former honorary investment counselor at the embassy, for their contributions to organizing the event and strengthening bilateral ties. There are more than 12,000 Pakistanis in South Korea, including businesspeople, students and workers. The embassy previously hosted an exhibition on the Gandharan civilization last year, which featured more than 20 Buddhist artifacts from Pakistan’s Taxila region. The event attracted over 100,000 visitors, according to the embassy. On June 25, the diplomatic mission organized an investment conference that brought together more than 140 Korean and Pakistani business leaders.